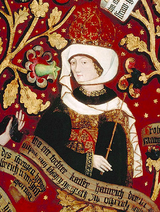 Biography*: Agnes of Germany (1072/3 – 24 September 1143), also known as Agnes of Waiblingen, was a member of the Salian imperial family. Through her first marriage, she was a Duchess consort of Swabia; through her second marriage, she was a Margravine consort of Austria. She was the daughter of Henry IV, Holy Roman Emperor, and Bertha of Savoy. Her maternal grandparents were Otto, Count of Savoy, and Adelaide of Susa. Her brother was Henry V, Holy Roman Emperor. Following Frederick's death in 1105, Agnes married Leopold III (1073-1136), the Margrave of Austria (1095-1136). According to a legend, a veil lost by Agnes and found by Leopold years later while hunting was the instigation for him to found the Klosterneuburg Monastery. Biography*: Leopold II (German: Luitpold, 1050 – 12 October 1095), known as Leopold the Fair (German: Luitpold der Schöne), was the Margrave of Austria from 1075 to his death in 1095. He was a member of the House of Babenberg. Leopold the Fair was born in 1050, the son of Ernest and Adelaide of Eilenburg, the daughter of Dedi I, Margrave of the Saxon Ostmark. In the Investiture Dispute, he first sided with Emperor Henry IV, but in 1081 at the Diet of Tulln switched sides under the influence of his wife Ida and Bishop Altmann of Passau. Subsequently, he was deposed by the Emperor, who gave the fief to Vratislav II of Bohemia, who defeated Leopold in the Battle of Mailberg. Ultimately, Leopold managed to retain his position, but he lost some territory in Southern Moravia, but Luitpold of Znojmo, Duke of Moravia was his son in law. Leopold resided in Gars am Kamp. In 1089 Leopold helped pay for the construction of Melk Abbey in eastern Austria by donating the land for the new Abbey. A few miles away from Melk Abbey, in eastern Austria, are the ruins of Thunau a Kamp castle, once a summer residence of Leopold. In 1065 Leopold married Ida, countess of Cham (1060–1101), in Cham, Oberpfalz, Bavaria. Ida was the daughter of Rapoto IV and Mathilde. Ida is said to have died during the crusade of 1101. [S746] Wikipedia, online http://Wikipedia.com, https://en.wikipedia.org/wiki/Ernest,_Margrave_of_Austria. 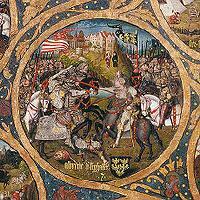 Biography*: Ernest (German: Ernst, 1027 – 10 June 1075), known as Ernest the Brave (Ernst der Tapfere), was the Margrave of Austria from 1055 to his death in 1075. He was a member of the House of Babenberg. He was born to Margrave Adalbert of Austria and his wife Frozza Orseolo, daughter of Doge Otto Orseolo of Venice. He increased the territory of his margraviate by amalgamating the Bohemian and Hungarian frontier marches up to the Thaya, March and Leitha rivers in what is today Lower Austria. In his time, the colonisation of the remote Waldviertel region was begun by his ministeriales, the Kuenring knights. Ernest received his epithet due to his fighting against King Béla I of Hungary and his son Géza I on behalf of their rival Solomon according to the chronicler Lambert of Hersfeld. In the commencing Investiture Controversy, he sided with King Henry IV of Germany and battled against the Saxons, dying at the Battle of Langensalza. [S746] Wikipedia, online http://Wikipedia.com, https://en.wikipedia.org/wiki/Adalbert,_Margrave_of_Austria. 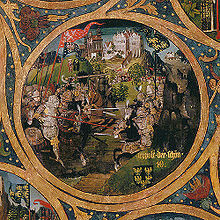 Biography*: Adalbert (German: Albrecht, c. 985 – 26 May 1055), known as Adalbert the Victorious (German: Albrecht der Siegreiche), was the Margrave of Austria from 1018 until his death in 1055. He was a member of the House of Babenberg. Adalbert the Victorious was the third son of Leopold the Illustrious and Richardis of Sualafeldgau. 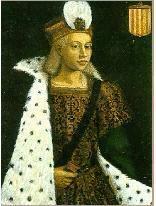 He succeeded as Margrave upon the death of his older brother, Henry I, Margrave of Austria. As Margrave, he extended the eastern border of the then small Ostmark of Bavaria as far as the rivers Morava/March and Leitha and supported King Henry III in his battles against Hungary and Bohemia. He resided in the Lower Austrian Babenberg castle of Melk, where Melk Abbey was to develop later. Adalbert married first Glismod of West-Saxony. They had no known children. Biography*: Æthelwulf (Old English for "Noble Wolf") was King of Wessex from 839 to 858. In 825 his father, King Egbert, defeated King Beornwulf of Mercia, ending a long Mercian dominance over Anglo-Saxon England south of the Humber. 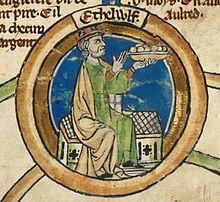 Egbert sent Æthelwulf with an army to Kent, where he expelled the Mercian sub-king and was appointed sub-king. After 830 Egbert maintained good relations with Mercia, and this was continued by Æthelwulf when he became king in 839, the first son to succeed his father as West Saxon king since 641. The Vikings were not a major threat to Wessex during Æthelwulf's reign. In 843 he was defeated in a battle against the Vikings at Carhampton in Somerset, but achieved a major victory at the Battle of Aclea in 851. In 853 he joined a successful Mercian expedition to Wales to restore the traditional Mercian hegemony, and in the same year his daughter Æthelswith married King Burgred of Mercia. In 855 Æthelwulf went on pilgrimage to Rome. 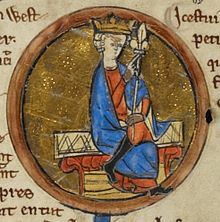 In preparation he gave a "decimation", donating a tenth of his personal property to his subjects; he appointed his eldest surviving son Æthelbald to act as King of Wessex in his absence, and his next son Æthelberht to rule Kent and the south-east. Æthelwulf spent a year in Rome, and on his way back he married Judith, the daughter of the West Frankish King Charles the Bald. 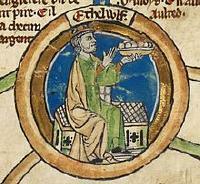 When Æthelwulf returned to England, Æthelbald refused to surrender the West Saxon throne, and Æthelwulf agreed to divide the kingdom, taking the east and leaving the west in Æthelbald's hands. On Æthelwulf's death in 858 he left Wessex to Æthelbald and Kent to Æthelberht, but Æthelbald's death only two years later led to the re-unification of the kingdom. Biography*: Egbert (771/775–839), also known as Ecgberht, Ecgbert, or Ecgbriht, was King of Wessex from 802 until his death in 839. His father was Ealhmund of Kent. In the 780s Egbert was forced into exile by Offa of Mercia and Beorhtric of Wessex, but on Beorhtric's death in 802 Egbert returned and took the throne. Little is known of the first 20 years of Egbert's reign, but it is thought that he was able to maintain the independence of Wessex against the kingdom of Mercia, which at that time dominated the other southern English kingdoms. In 825 Egbert defeated Beornwulf of Mercia, ended Mercia's supremacy at the Battle of Ellandun, and proceeded to take control of the Mercian dependencies in southeastern England. In 829 Egbert defeated Wiglaf of Mercia and drove him out of his kingdom, temporarily ruling Mercia directly. Later that year Egbert received the submission of the Northumbrian king at Dore. The Anglo-Saxon Chronicle subsequently described Egbert as a bretwalda, or "Ruler of Britain". Biography*: Ealhmund was King of Kent in 784. He is reputed to be the father of King Egbert who was King of Wessex and, later, King of Kent. He is not known to have struck any coins, and the only contemporary evidence of him is an abstract of a charter dated 784, in which Ealhmund granted land to the Abbot of Reculver. By the following year Offa of Mercia seems to have been ruling directly, as he issued a charter without any mention of a local king. General consensus among historians is this is the same Ealhmund found in two pedigrees in the Winchester (Parker) Chronicle, compiled during the reign of Alfred the Great. The genealogical preface to this manuscript, as well as the annual entry (covering years 855–859) describing the death of Æthelwulf, both make King Egbert of Wessex the son of an Ealhmund, who was son of Eafa, grandson of Eoppa, and great-grandson of Ingild, the brother of King Ine of Wessex, and descendant of founder Cerdic, and therefore a member of the House of Wessex. A further entry has been added in a later hand to the 784 annal, reporting Ealhmund's reign in Kent. Biography*: Osburh or Osburga was the first wife of King Æthelwulf of Wessex and mother of Alfred the Great. Alfred's biographer, Asser, described her as "a most religious woman, noble in character and noble by birth". Osburh's existence is known only from Asser's Life of King Alfred. She is not named as witness to any charters, nor is her death reported in the Anglo-Saxon Chronicle. So far as is known, she was the mother of all Æthelwulf's children, his five sons Æthelstan, Æthelbald, Æthelberht, Æthelred and Alfred the Great, and his daughter Æthelswith, wife of King Burgred of Mercia. She is best known for Asser's story about a book of Saxon songs which she showed to Alfred and his brothers, offering to give the book to whoever could first memorise it, a challenge which Alfred took up and won. This exhibits the interest of high status ninth-century women in books, and their role in educating their children. [S849] 1881 Canada Federal Census, 101 Newbury Street, Boston, Suffolk, Massachusetts, USA. Biography*: Ramon Berenguer II the Towhead or Cap de estopes (1053 or 1054 – December 5, 1082) was Count of Barcelona from 1076 until his death. He ruled jointly with his twin brother, Berenguer Ramon II. The Chronicle of San Juan de la Pena called him, ". . . exceeding brave and bold, kind, pleasant, pious, joyful, generous, and of an attractive appearance. Because of the extremely thick hair he had on top of his head, he was known as Cap d'Estop." He succeeded his father, Ramon Berenguer I, Count of Barcelona, as co-ruler with his twin brother, Berenguer Ramon, in 1075. The twins failed to agree and divided their possessions between them, against the will of their late father. Ramon Berenguer the Towhead, so called because of the thickness and colour of his hair, was killed while hunting in the woods in 1082. His brother, who went on to become the sole ruler of Catalonia, was credited by popular opinion of having orchestrated this murder. Berenguer Ramon the Fratricide was later succeeded by Ramon Berenguer's son, Ramon Berenguer III. Ramon Berenguer married to Mahalta (or Maud) of Apulia, born ca. 1059, died 1111/1112, daughter of Duke Robert Guiscard and of Sikelgaita de Salerno. 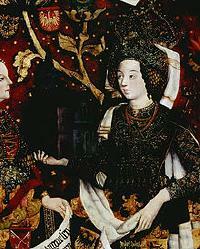 Following his murder, she remarried to Aimery I of Narbonne, and was the mother of his son Aimery II. [S746] Wikipedia, online http://Wikipedia.com, https://en.wikipedia.org/wiki/Ramon_Berenguer_II,_Count_of_Barcelona.